I’ve made some great friends in the blogosphere, y’all. Some GREAT friends. In fact, these people – fellow writers from all over the world – have given me a reason to keep my Twitter account activated. Because my finger was poised right over that little “deactivate” button for a week or so. I just couldn’t figure out what the point of Twitter was, you know? And the blog was created for family and friends to keep up with all the “book stuff” as we so professionally called it. But then I met all my new friends at the #amwritingparty on Twitter! (If you don’t know what that is, well… you’re missing a good time, folks.) And suddenly it all had a purpose, and I backed away from the deactivation button. If that doesn’t say friendship, I don’t know what does. Now. Pretend that all that had something to do with what I’m about to say here. 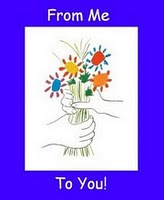 I have been bestowed with two new blog awards by the fabulous Sara McClung over at The Babbling Flow of a Fledgling Scribbler and Carol over at Carol’s Prints. I know! SO exciting! And these two ladies… well, let’s just say they bring cool and sassy to a whole new level. A level I will always be standing just slightly below, looking up at them in wonder and thinking about how pretty they are. No, seriously. Go to their blogs and follow them. Go right now. You’ll regret it if you don’t! Alright. Carol’s award is the easiest to reciprocate, so I’m going to start there. 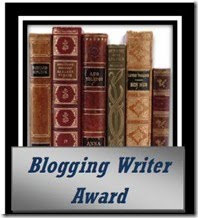 Here is the award, and here are a few blogs that are just delightful. I would highly recommend you visit! 1) J. Koyanagi at her self-titled blog. I have just discovered her, and I feel like she’s got stuff to say. Good stuff. Plus her website is super fly and she’s a doll. 2) Elaine Smith over at Still Writing. Great tips about writing and a great voice. Love her. 3) Jon Carter at the Reader’s Cafe. Jon teaches English and creative writing with me at ye olde high school, and people, he is brilliant. BRILLIANT. He’s currently looking for an agent for his own manuscript, as well. 4) Sophie, a.k.a Boo Mama, over at BooMama. I know, I’ve recommended her before, but she is just so darn FUNNY. And she also works with me at the school. And she is my hero. Ok. Sara’s award involves a bit more work on my part, and it also requires that I talk about myself, which I’ve never been good at. Feel free to just stop reading now, because this could end up being totally lame. Or possibly embarrassing. Or both. But regardless, I am supposed to tell 7 things about myself, so… here we go! 1) When I was in the 7th grade, I was 5’9″ and 120lbs. I also wore gigantic gold-rimmed glasses with lenses that were about a half-inch thick (this was before they could make them thin and pretty) and I had braces. I also had this awesome shag haircut that really brought out the frizz in my hair. I wore a lot of flannel vests and denim wrap skirts. Tragic. 2) I spent the spring semester of 2003 as an exchange student in Spain. I went to a little school in the town of Alcala de Henares, which is about 20 minutes outside Madrid. I did not know anyone else and had to make all my friends from scratch, while speaking a different language. It was the most terrifying and exhilarating thing I have ever done. 3) I am an ALABAMA FAN!! Roll tide! I went to school at UA, but the funny thing is, my ENTIRE family went to Auburn – which is Alabama’s arch-rival. So I am totally the black sheep. 4) I once threw a pair of my shoes into the Thames River. Yes, the one in London. Nope, you don’t get an explanation. 5) And while we’re talking about Europe, I’ll go ahead and tell you that I almost got arrested in Lisbon, Portugal, for walking out on a bogus check at a restaurant. Long story, but trust me, the walk-out was justified. Getting chased through the streets and subsequently caught by an angry restaurant manager may not have been worth it, though. 6) I completed my fourth or so manuscript last January, and have been editing, revising, and submitting it to editors via my agent ever since then. It’s been a long process, and no one’s bought it yet, but we’re hoping to make a few changes to the story and start submitting again at the end of this January or maybe early February. 7) I teach Spanish 2 and Spanish 3 at the high school I graduated from. It’s a pretty awesome gig. My students are 11th and 12th graders, so they are interesting and fun and usually smarter than me. Alright – thanks again, Sara and Carol! Love you guys! You're the best, Anne. It was a pleasure to pass the award on to you. And I'm so glad that Sara passed on the other one as I loved learning about you. I have a feeling we could talk for hours about our European adventures!! I love that you threw your shoes in the Thames!! You rock (and I'm dying to know this story now!). Thank you for your lovely compliments, m'dear. Too much to much!! Happy holidays! Congrats on the awards! I agree – Sara & Carol are AWESOME! Congrats on the awards, good lady! And yes, the #amwritingparty is teh coolest (when I can manage to find the time to attend)! I totally agree about #amwritingparty. What a great bunch– including you! And of course, thank you for the award and for the words. It's much appreciated and I'll pass it along! Best wishes toward your manuscript finding a home. …"for the words"? Ahem. I meant, "for the kind words". Evidence I shouldn't comment on blogs before I've finished my first latte of the morning. I haven't yet gained the courage to enter the world of Twitter, having only just ventured into the Blogosphere, but thanks for the encouraging word. I will try it sometime, I'm sure. LOL hahahah I just about rolled on the floor laughing Anne – seriously! If you won't share about throwing shoes in the Thames. Then I QUADRUPLE DOG DARE YOU to post a picture from seventh grade! I. Must. See. This. Anne + rowdy Brits + a little too much of grampa's old cough syrup = shoes in the river. OOOOOOOOOH COME.ON!!!!!! I'll find something equally bad of myself and post it if you do. WE CAN HAVE A BLOGOSPHERE AWFUL EMBARRASSING PICTURES DAY!!!!!!!!!! P-p-p-p-p-pleeeeeeaaaaassssseee?? Alright then! YOU'RE ON!! I bet mine will be ten million times worse than yours, though!! AHH! Yes, Roll Tide! My WHOLE family is from Alabama but we moved to Texas a few years back, so the whole Bama/Texas game is going to be a…tense time. love to hear about you–the shoes in the Thames is a great one! Merry Christmas!